Almost every day, the local news media carry at least one story about issues affecting the coastal areas of Maui and the other Hawaiian Islands. News coverage is an important source of information for many people. This unit engages students in examining coastal issues and how they are covered in local papers. Students collect, analyze, and discuss newspaper articles covering coastal issues on Maui. Students research, conduct interviews, and write their own newspaper-style articles on a Maui coastal issue of their choosing. Three class periods over a one- to three-week span, plus optional in-class research, coordination, and presentation time. 1. What current coastal issues are being covered in local newspapers? 2. How do newspaper reporters cover issues when there are multiple points of view? 3. How can students develop a deeper understanding of coastal issues through their own investigations? Coastal areas tend to be heavily used and inhabited. Disagreements over the appropriate use of these areas are the basis of issues that we often learn about through media coverage. Understanding coastal issues and how they are communicated through the media is critical to prepare students to play a productive role in society. • Follow television and radio coverage on coastal issues. Take notes on these stories while watching or listening to them, including noting the name of the reporter; the date, time, and station of the broadcast; and information about the issue including the names of people and organizations that are mentioned. 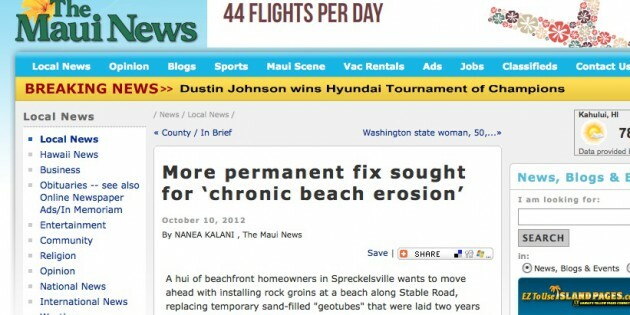 Add these notes to the “Coastal Issues in the News” portfolios. • Invite a local reporter who covers coastal issues to come into class and talk about how he/she works. Prepare questions for the guest speaker based on the investigations in this unit. • Write a letter to the editor about a coastal issue. • Submit the best articles from Activity #2 “Coastal Journalism Projects” to the newspaper. • Create radio or television news spots based Activity #2 investigations. • Create a contest in which students or teams devise solutions to the issues they are researching in Activity #2, and write a newspaper article about the proposed solution. Give the whole class the opportunity to vote for the best solution, and give a “Pulitzer Prize” for the best article. • Student teams make class presentations based on their Activity #2 research and articles. Ramsey, J. M., Harold R. Hungerford, and Trudi Volk, “A Technique for Analyzing Environmental Issues,” The Journal of Environmental Education, Vol. 21 No. 1, 1989. “The Hawaiʻi Newspaper Index” at <www.hcc.hawaii.edu/education/hcc/library/hiindex.html>. Access to the Hawaii Newspaper Index is provided through the Hawaii State Public Library System (HSPLS) via Telnet. Honolulu Star-Advertiser Newspaper. Includes on-line versions of back issues for preceding three months. The Maui News. Includes archives for several months of back issues.